Shopping and Spa-ing… Do you go it alone? I’ve already declared my preference for shopping solo before… it’s a control thing. My tastes are probably different to yours and I don’t wanna spend 20 minutes pretending to like that green eyeshadow you’ve gone all misty-eyed for. I mean… “Hey! Why don’t you come over here instead and examine these 7 different taupes with me whilst I delve into miniscule detail noting all the subtle differences between them”. See the problem? I’m not a very compatible or companionable person whilst shopping. Just leave. me. alone. 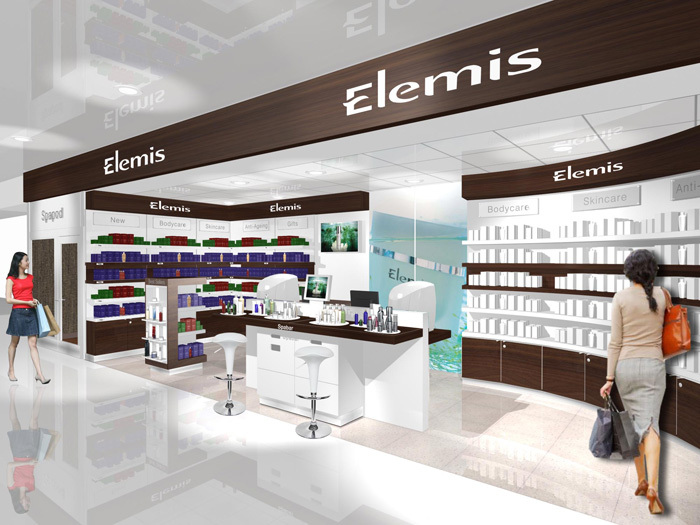 So, it’s with interest that I saw Elemis’ latest launch! By the way… this is supposed to be a graphical representation of Debenhams on Oxford St… I wanna know why there’s only two women in the picture? There should be at least 50… all foaming at the mouth… pushing, snarling and invading one another’s personal space whilst clutching their little yellow Selfies bags from down the road. Launching this May is the world’s first Double Elemis SpaPod. Now there are two treatment rooms available so you can book in alone or if with a friend you can both stop for advanced facial therapy and total body revival before you continue to shop! Each treatment is carried out whilst you relax on an Intelligent Massage Chair that measures the length of the spine, takes your body weight, warms the body and is then programmed to deliver a customised massage using a variety of techniques, working specifically on any problem areas. Are you a sociable shopper? Do you take your girlfriend’s to the loo with you? Do you want one of those Elemis massage chairs for your front room too? This sounds so good, especially being able to shut everything out! I’ve been told I’m not the most pleasant of people to shop with, I have things I want to look at and I hate deviating to something that does not interest me. I tend to prefer shopping alone. I’m a moth, I run all over the place like “OH THIS IS NICE. OHH SHINEY. OMG LOOK AT THIS” and my friends are not the same. But I like company…so usually we go shopping together, seperate in the shop to do our own thing, then reconveen at the changing rooms if clothes, or till otherwise, and then go to the next shop/eating establishment. If I am on a total mission I’ll go alone. I get dragged into places I hate when I go shopping with other people, and they don’t get my love of makeup. I bought a new lipgloss yesterday and my friend was like YOU ALREADY HAVE LOADS YOU DON’T NEED ANY MORE. She doesn’t get it. I am a solo shopper and spa-goer, mainly because I tend to do both on business trips! I am a solo shopper at heart. I really don’t like the idea of subjecting someone to having to wait for me. I just can’t live with that thought at all and I think it would be pure torture for them. By contrast, I’ve done some very charitable actions, whereby I willingly accept to follow someone to accompany them shopping and that the day is all about them. I then stop becoming a person with its own mind and becomes a coat hanger, a bag holder& sitter and a figure comforter. “of course your bum does not look big in 2 sizes too small beige pair of trousers with vpl extravaganza” The person who I would call friend, would just totally take the p*ss of the situation and subject me to hours of waiting round. This would involve, for example, sitting around in a mobile phone shop, for 1 hour while ‘friend’ tries to set up a contract and things like that. I would not dream to make someone wait for me for this kind of things. When it comes to clothes shopping, I don’t need someone to tell me if something fits or not and I am ultimately the person who makes the decision. Finding trousers which fit is a problem and i’ve been known to try more than 50 pairs in one afternoon, finding none that fits, and virtually wanting to throw myself out of the window at the end of the day as it was so depressing coming back empty handed, and I do not wish to subject the waiting around, frustration and more bad mood than usual to anyone. I don’t mind doing some mild window shopping with boyfriend if applicable, when I spot something and I ask ‘oh pleaaaase, can i just go and have a look for a minute’ and try to make it as quick as possible to minimise inconvenience. As for the ‘go with a mate’ thing, the idea puts me off. Bad enough you need to have someone to go on holiday, cinema etc but now I need a buddy to go shopping too? I can already see myself enquiring about prices of stuff, and that it would be double if you want to book it for one person, like the single supplement charge on holiday. I’m absolutely a solo shopper! If I went with friends I’d never buy anything! I shop alone. I refuse to take the fiance after an incident in Zara where he informed the entire shop at the top of his voice exactly how much I owe my credit card company. I will not go with girls either. I’m not a potterer and I abhor the idea of doing one tour, noting down the things I like, then going back round again to buy what I want. No thanks. Shop hard and fast, then go to the pub (not alone there, that would be bad). I went to a spa on my own last month and I loved it. I felt a bit lonely at lunchtime when I had a table to myself and everyone else was sat gossiping with their friends but once I’d got over that, it was fine. It was the spa of an awesome hotel near us and I entertained myself by pretending it was my house and the other people there were just visitors. Ha. I do both, but especially for clothes I usually prefer to go with someone else. It’s just that I really don’t enjoy shopping that much, so if there’s someone with me it makes it more fun. My hubby does 3d Visualisations for a living so I feel qualified to say that the Elemis visualisation is really badly done! I hate spas on my own. I’d far rather go with someone. Group spa anyone??? My hairdresser has a massage chair which I always have on full whack! Judder, judder, shake, rattle and roll. Shopping? For that I want to be alone to linger or speed along as I so desire. But most of my shopping is online. I only have 1 or 2 girlfriends I allow myself to shop with. So, i’m more a solo shopper, I can do whatever I want, where I want, how long I desire. I definitely prefer to shop alone especially when it comes to beauty purchases. I like to spend time looking at things and testing without feeling rushed when I am with someone else. I can relax and enjoy shopping when solo. I do however like sometimes clothes shopping with my sister as she is much more into that then beauty. I have almost always got beauty treatments alone, it doesn’t bother me at all. My dear mother recently forced– er, *invited* herself along on what I’d originally planned as an extremely quick and businesslike bra refitting and purchase. Every time I peeked out of the dressing room to consult with the salesgirl, mom’s screechy squawks of “HOW DOES IT FIT?” and “MAKE SURE YOUR NIPS DON’T POKE OUT!” mortified me right back into the dressing room. Ack. This confirmed what I already knew well: shopping solo is the way to go. And don’t tell your mother when you’re planning a trip to the mall. I’m generally a solo shopper unless I’m with a fellow make up addict! Make up shopping with people who are not into make up is just not fun at all. I’ve been shopping with fellow bloggers before and had a fantastic time, they’re usually the worst enablers!! I have never quite understood the whole going the loo with your friend thing. I love my friends, but I do not want to see them doing wees! I haven’t brought a girlfriend to the loo with me since I was 13 and needed to gossip. I do sometimes go to the nail salon with my mom or a friend. Massages might be creepy, to be honest. I would love a chair, though!